A production flow chart is very important when planning the manufacture of a product. Although CNC products can be small, quality in manufacture is crucial. Draw a flowchart similar to the one below. This should explain every stage of the manufacture of a product you have produced through the use of a CNC machine. Include a number of quality checks. Quality control is an essential part of any project and at any stage the product may be rejected if a fault or inaccuracy is found. To help you create your production flow chart the stages involved in the manufacture of a CNC project are listed on the previous page. Also a photograph of the product, with details are shown below. Remember to include quality control. This is a small trophy for a cyclist. The part manufactured through CNC is the rectangular clear plastic piece. This has been engraved using a CNC machine. 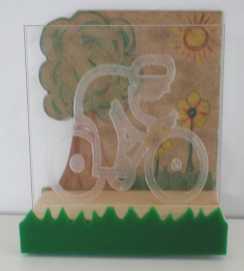 The trophy also has an MDF back which has been coloured to provide scenery and a small green plastic front shaped to give the illusion of grass. 1. What is a recycle bin? 2. How could products placed in the recycle bin be used if they cannot be recycled?